the perspective of academic, industrial and government experts. The rising trend of self-driving cars has pushed the envelop for the state of the art vehicular technologies and has evolved several day to day applications. This evolution required better sensing hardware, robust planning algorithms and the best control methods. At this juncture, the robotics community has identified and addressed most of the pressing issues to develop the foundation of self-driving cars. As we advance this field to build higher levels of applications such as intelligent and cooperative networks, we need a complete understanding of its fundamentals. Therefore, the goal of this workshop is to discuss and learn about the state of the art of self-driving car technologies from academic, industrial and government experts and be prepared to move together as a community to the next level of autonomous intelligent world! The following are proposed topics of interest to be discussed during the workshop. We are soliciting extended abstracts (1-3 pages) describing novel work on self-driving cars and related technologies. Accepted submissions will give a short spotlight talk and present their work in the interactive session. Submissions should be sent to icra17self-driving@smart.mit.edu before the "extended abstract submission" deadline, Feb. 28, 2017 (AoE). The workshop presenters and attendees will be given an opportunity to take a closer look at the SMART self-driving vehicles (car, buggies, and mobility scooters) and will also get a chance to experience a ride on one of the vehicles. Speakers and participants will be encouraged to bring their computers/sensors to put in our self-driving car and collect data during the demonstrations. The data collected will be made available to the workshop participants after the conference. Abstract: Autonomous robots are faced with a series of learning problems to optimize their behavior. In this presentation I will describe recent approaches developed in my group based on deep learning architectures for perception and navigation. In particular, I will discuss approaches to object recognition, body part segmentation from RGB(-D) images, terrain classification, and mobile robot navigation. For all approaches I will describe the underlying network architectures as well as the required data augmentation techniques. I will present the results of expensive experiments quantifying in which way the corresponding algorithm extends the state of the art. Abstract: Change is always hard to deal with. But deal we must. Change in the autonomous vehicle context comes from weather, lighting, scene dynamics and building work. I will talk about some of the approaches we are taking in dealing with scene change in the context of the localisation task using both laser and vision based systems. Abstract:These trends are considered individually but foremost the potential of their combination is discussed. We investigate which sensor configurations may be sufficient for automated vehicles. We show that cognitive and autonomous vehicles with a few close-to-market sensors are feasible. Vision plays the dominant role in our autonomous vehicle. We completely avoid bulky on-roof mounted sensors. The sensor suite enables the vehicle to perceive its environment and automatically navigate through every day’s traffic. The augmentation of sensor information by prior knowledge from digital maps is elaborated. Real-time automated decision-making and trajectory planning methods are outlined. The potential of cooperative information exchange and distributed decision in traffic is outlined. Extensive experiments are shown in real world scenarios from our AnnieWAY vehicle, the winner of the 2011 and second winner of the 2016 Grand Cooperative Driving Challenge, and from the Bertha vehicle that drove autonomously on the 104 km of the Bertha Benz memorial route from Mannheim to Pforzheim through a highly populated area of Germany. Abstract:The lack of robustness and of efficiency current Embedded Perception and Decision-making systems is one of the major obstacles to a full deployment of self-driving cars. In this talk, it will be argued that three enabling technologies are required for improving the capabilities of such systems: (1) a framework for fusing multiple-sensor data in the presence of uncertainty and interpreting in real-time the surrounding dynamic environment, (2) a method for predicting future environmental changes using perception history, contextual information and some prior knowledge, and (3) a decision-making approach having the capability to continuously evaluate the risk of future collisions and to provide on-line maneuver recommendations for a safe navigation. New approaches developed at INRIA for Embedded Multi-sensors Perception, Situation Awareness, Collision risk assessment and on-line Decision-making for safe navigation, will be presented. It will be shown that Bayesian approaches are mandatory for developing such technologies and for obtaining the required robustness in the presence of uncertainty and of complex dynamic situations. The talk will be illustrated by experimental results obtained in real traffic situations, in the scope of several collaborative projects involving Toyota, Renault, CEA-LETI, or the French IRT (Technological Research Institute) Nanoelec. Abstract:Over the decade, researchers have been investigating viable technologies to realize autonomous driving in urban environments. Some key components of urban autonomous driving are the abilities to simultaneously detect and track multiple obstacles and decide optimal action policy. The autonomous vehicles should be robust to uncertainties including, but not limited to, sensor noises or unpredictable movement of moving objects. While there has been large progress in the technologies, there still remain many challenges that make the autonomous driving hard in urban environments. They include diverse dilemmas that we frequently encounter in daily driving. In this talk, we will discuss several key issues related to dilemma situations in urban autonomous driving. We will briefly introduce the approaches taken in SNU, and additionally, show some selected results of our research activities including the SNU Automated Drive, called SNUver. Abstract:Everybody agrees that full autonomy in all conditions is the ultimate goal for self-driving cars. However, views of which path to take to arrive at this goal differ. In this talk, I will make the case for the “parallel autonomy” or level 2.99 approach to self-driving car development. In this paradigm, the driver is still an active participant in the driving task with the autonomy system monitoring the driver and the outside world, ready to intervene in the case of an imminent crash. I will share some preliminary results that we have achieved towards the development of a parallel autonomy platform as part of the Toyota funded MIT-CSAIL partnership, and I will discuss future directions that we plan to take to achieve our goal. Abstract:In this talk I will discuss some of the ways we have exploited models of user satisfaction and trust in self-driving vehicles subject to shared control. We have looked at how comfortable a user is with a robot vehicle's performance ("trust") as both a mechanism to better understand user interaction, as well as a means to modulate adaptive behavior. Our work on user trust addresses explicit models of a user's mental state. In operational systems we make the requisite observations using only implicit cues, but as part of our user studies we have examined user state using a range of explicit and implicit query mechanisms. This work has been deployed in the domains of Unmanned Aerial Vehicle (UAV) systems, self-driving cars and other robots. In each case, using adaptive methods that can provide substantial advantages over what could be achieved using hand-tuned approaches. Abstract:Cars tend to treat people like obstacles whose motion needs to be anticipated, so that the car can best stay out of their way. This results in ultra-defensive cars with opaque behaviors. Modeling people like moving obstacles misses on a key aspect of interaction: it's not just the car responding to a person's actions, the person will also inevitably respond to the car's actions. We introduce a mathematical formulation of interaction that accounts for this, and show how learning and optimal control can be leveraged to generate car behavior that results in natural coordination strategies, like the car negotiating a merge or inching forward at an intersection to test whether it can go. Abstract:This talk will present an overview of the technology enabling nuTonomy's autonomous cars, and its Mobility on Demand service. It will also cover lessons learned and insights gained during testing on public roads in Singapore and in Boston, including the first world-wide public test of "driverless taxis." Abstract:The robotics, machine learning and computer vision communities are making an enormous impact on the transportation industry. The confluence of advances in machine learning and computing power together with vast quantities of labeled data have led to impressive results approaching and sometimes surpassing human capability. At Zoox, we are leveraging and extending these trends to usher in the future of robotic mobility. We are building a safe and reliable autonomous mobility service that will have profound economic, environmental, and societal benefits. In this talk, I will discuss Zoox's holistic vision for tackling this challenge of a lifetime and the role robotics plays in making it possible. Abstract: Self-driving cars is a very active area of research in both academia and industry. Apart from personal transportation, an equally important industry is transportation of goods over large distances. Otto is a start-up company founded in January of 2016 to bring autonomy to long-haul trucking. It was acquired by Uber only seven months later. Dr. Berg joined Otto from its inception, and has led the motion planning effort with Otto. In this talk he will focus on specific technical challenges in motion planning and control for trucks versus personal vehicles. In particular, he will show a particular example of a nice algorithmic and mathematical challenge that arises in motion planning for autonomous vehicles: how to compute the distance to a polyline. 1. Ray Distribution to Parallel Batching-based Updates - Youngsun Kwon and Sung-eui Yoon. 2. Lifelong Vehicle Localization in Hybrid Environments Using a 3D LiDAR - Philipp Egger, Paulo V K Borges, Gavin Catt and Andreas Pfrunder. 3. AutonoVi: Autonomous Vehicle Planning with Dynamic Maneuvers and Traffic Constraints - Andrew Best, Sahil Narang, Daniel Barber and Dinesh Manocha. 4. Perception and Automation for Intelligent Mobility in Dynamic Environments - Lukas Rummelhard, J ́erˆome Lussereau, Jean-Alix David, Christian Laugier, Salvador Dominguez, Gaetan Garcia and Philippe Martinet. 5. The Oxford RobotCar Long-Term Autonomy Benchmark - Will Maddern, Geoffrey Pascoe, Brian Yeomans and Paul Newman. 6. Interaction-Aware Tracking and Lane Change Detection in Highway Scenarios Using Realistic Driver Models - David Sierra Gonzalez, Victor Romero-Cano, Jilles S. Dibangoye, and Christian Laugier. 7. Trajectory Optimizer for an Autonomous Truck in Container Terminal - Jennifer David, Rafael Valencia, Roland Philippsen, Pascal Bosshard and Karl Iagnemma. 8. Vision-based Moving Object Detection and Tracking at Intersections - Shashwat Verma, Hai Xun Kong and You Hong Eng. This workshop is support by IEEE-RAS Technical Committee on “Autonomous Ground Vehicles and Intelligent Transportation Systems" and Singapore-MIT Alliance for Research and Technology (SMART). 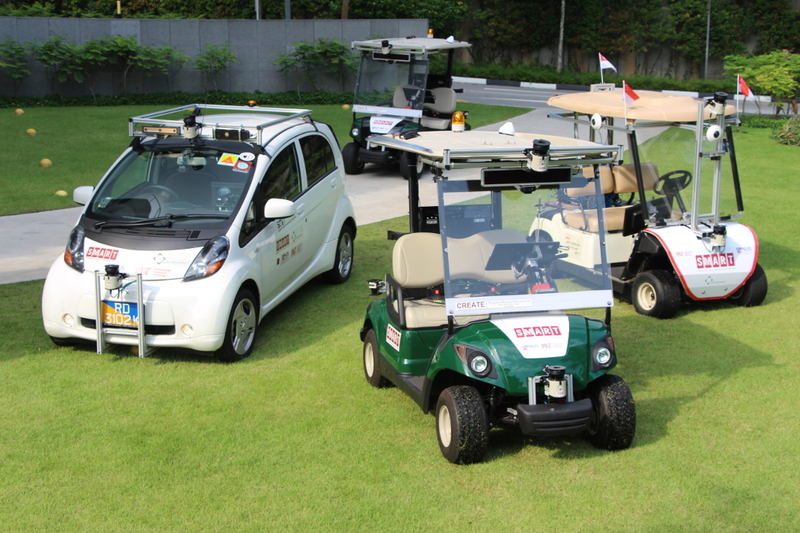 SMART and NUS will be showcasing its fleet of self-driving vehicles to ICRA attendees on 30th May between 6 pm - 9 pm. Check out this link for more details.